Home / Blog / Introducing the ThermoTooth 3000! Here it is – what I’ve affectionately dubbed the ThermoTooth 3000 – a fully wireless, dual channel, K style thermocouple prototype. She had her first successful Bluetooth session with my Mac tonight, and even with her limited code, she’s quite a smart gal! Over a simple wireless serial connection via terminal, I am able to select which thermocouple to monitor, and trigger individual Celsius or Fahrenheit readings, or both. No special drivers – just a Bluetooth serial connection. For the geeks like me, she’s built on an Arduino Uno prototyping controller board. Stacked on top of that is an XBee shield, providing the networking connectivity beyond the basic USB already present on the UNO. The XBee shield currently houses a Seeed Studio Bluetooth Bee, which provides the Bluetooth connection layer. The two K-style thermocouples connect to the Uno via two Max6675 chips, each providing cold-junction compensation and digital conversion of the thermocouple voltages for its independent channel. The sheer amount of electronics here is definitely overkill – I’m sure the cumulative brains of this could drive a car, but that’s how prototyping works. First off – it’s not meant for live production. I built it in the hopes I could pair it with an iOS device, and negotiate a wireless serial connection via Bluetooth. I know the device functions well, but the external connectivity of iOS itself still holds unknowns for me. The XBee shield offers the advantage of being able to swap a regular wireless network interface for the Bluetooth module in case the Bluetooth method is unsuccessful. Hopefully, a more permanent solution is on the way. I’ve been contacted by a manufacturer who is currently developing a Bluetooth thermocouple they plan to bring to market this fall. Naturally, this is great news for a lot of us looking for automated readings. They have not discussed the expected price, but the product itself sounds great! The manufacturer has agreed to sending me a prototype for evaluation once the release date gets closer, but in the mean time – I needed something to develop with now. This is why I built the TT3000. The majority of the code involved to implement thermocouple support will likely be designing the Roastmaster interfaces and its internal data structures, and setting up the communications framework to be used between roasting curves and wireless devices in general. The Bluetooth serial protocol has seemed quite easy to work with while prototyping the TT3000, so I’m hoping that this venture will be successful, and that adding support for the new product (as well as any others that may crop up), will be fairly easy to add ONCE I get support for wireless thermocouples in general built into Roastmaster. I’ll post back here with updates as development progresses. This isn’t at the absolute top of my development list – there are several feature requests/tweaks I want to finish up first, but I plan to be working on this until I find a workable solution. As always – if you have any input – please let me know. Danny, as I have said elsewhere in your blog, resolution is important. I like Farenheit degrees better than Celsius because the degrees are smaller …!! If you are a coffee roaster you already know that, unless you choose otherwise, the temperature should be ‘rising’. If it’s drifting downward you might be baking instead. You can’t wait several minutes to know you just drifted down 2 Celsius degrees. What works for me is a resolution of 0.1 F degrees. Congratulations on finding ‘something’ (albeit overkill) that works. I looked a bunch for you …and found nothing. I’ll make sure to pass that on the manufacturer when we talk. I’m with you, I wouldn’t be happy with just integer readings – I think accuracy to a tenth of a decimal is good – but a hundredth might be better. I’ve mused at how cool it would be to one day add PID-style “brains” to Roastmaster. A way to learn from past roasts how the bean mass behaves for that particular roaster, and have it suggest the proper control temps throughout the roast, based on a custom temp reading “target” curve. Thanks – I really appreciate you looking. From working with my TENMA 72-7712 Thermocouple Reader, while the resolution is 0.1F the accuracy is not so great. I believe it is 0.5% +/- 1.5F. So, at 400F that would be +/- 3.5F (if I remember how to count on my fingers). It might come from wiring connections or different type K thermocouples, not sure. Actually, the accuracy is not as important as repeatability, when I’m roasting coffee. To help with that, the TENMA instrument has a software ‘adjustment’ so if I change thermocouples (say) I can zero out the error at the boiling point. That gives me confidence in the measuring system. I’d gladly pay 3 times the app price to be able to live plot my profiles on your app. I have a j-style thermo on an Ambex YM5, and have been trying to figure out how I can rig it to real time profile since I got it. I have super high hopes for this move on this app. Wish I was geeky enough to help figure it out. Good Luck and Happy Roasting! You and me both. Building the prototypes was fun, but in the end, it came down to the simple fact that iOS is very tightly locked, and there’s no easy way to get in an un-jailbroken device without the MFI proprietary hardware specs, at least in a way that would pass Apple’s review. I’m still anxiously awaiting the prototype from the vendor who contacted me about their upcoming MFI bluetooth thermocouple. We last spoke mid-summer, and they were shooting for prototypes this fall. Once I get the current update finished, I’m going to see how close they are. This would open up all kinds of possibilities for the app! Do you have a parts list for this? Bonus points if it can control a servo too. Thumbs up for wkoirng heat! and YAY for the Star Wars reference! 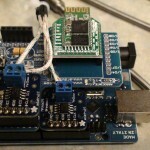 Check out some of the robot parts sites – they deal in Arduino and servos. Robotshop.com seems to be a good one. How about the iGrill. It’s a bluetooth device. Will that work? iGrill is the first grilling/cooking thermometer and app for iPod touch, iPhone and iPad. iGrill communicates with your device via a secure, long-range Blutooth connection. I bought one of these when they first hit the Mac store, thinking it was a sure-fire hit. I soon found out the probe only withstands temps up to 400F/204C which doesn’t even make it to second crack. They seem well-made for their purpose, though – just not for us, unfortunately. I actually have found something that works. I’m keeping quiet about it until I know for sure from Apple that it will be allowed by them since it’s via open-source hardware. I’ll write up a full review once I know for sure. In the mean time, I’ve already developed the probe front-end and its working great! That looks pretty wild. I’d heard of it, but never sat and watched the video. Thanks for the link. No – that’s not it. Everything in the dev version is still Roastmaster native – I’m just using open-source hardware to develop with in lieu of a standard commercial k-style thermocouple. I want to have the feature complete so that when probes do make it to market, Roastmaster is ready for them. 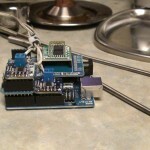 I had anticipated this hardware to be an ad-hoc type of thing, but after building my latest thermocouple, I realize it’s something that many folks would probably love to do, as long as Apple allows it on the app store. It’s easy to work with and extremely scalable – up to 24 probes per unit. I’ll write more soon – I just want to have some answers from Apple before stating anything on the record. I’d hate to have folks run out and buy hardware in anticipation, only to have Apple reject the next update. I definitely want to explore the earphone jack in the future, like in the link you sent. A few users have pointed that possibility out, and I want to explore that once I’ve finished with the wireless probes. Seems that would provide an extremely low-cost solution for monitoring and recording temps. Me, personally, I’ve really enjoyed being able to roast from my office with the wireless probes doing the a data-collecting, but many wouldn’t mind being tethered to the roaster if it’s a cheaper solution in hardware. Hi, just picked up your app, a Behmor 1600 and now have a Cole-Parmer thermocouple (http://www.amazon.com/gp/product/B003NV2LU0/ref=oh_details_o03_s00_i00) and would love to see direct capture of the temps. keep me on your list to update. Sure will. Roastmaster can track the Behmor curves and time shifts for you. Just make sure that the name of the roaster contains “Behmor”, and you’ll get the option to “Add Behmor curve” when you tap the curve button in the roasting screen. Whenever that curve is selected, the + and – graph scale buttons function as time shift buttons, mimicking the way the Behmor shifts it’s internal curves, with respect to whether or not the roast is in progress. Is there any way to exchange with others the curves we create? Yes. You can export single curves or entire profiles and/or programs. Just go to the details screen of the curve/profile/program, and tap the action button in the top left (the one that bounces when you arrive on that screen). Choose “Export…” and you’l be able to email, save to dropbox, or save to the documents folder on the iOS device. but of course – it’s not linked to iOS, but perhaps with an intermediary Mac OS device it could work. Ahhh – I had not seen that. I’m assuming it’s fairly new. I’ll have to give it a look – my Arduino is still sitting on the shelf, never having lived up to its potential. Lots of folks have been very patient while I’ve fleshed this out, and I think those that are waiting on data-logging will be pleased. Of course, things would be so much easier if Apple would just put a USB port on iOS devices. 🙂 I’m going to post a write-up here soon on the Phidgets hardware it will support, and the configuration options available. It’s very flexible, and has proven extremely fast and reliable. Thanks for posting this link. I want to eventually add support for anything that will interface with iOS, and I had no idea this existed.